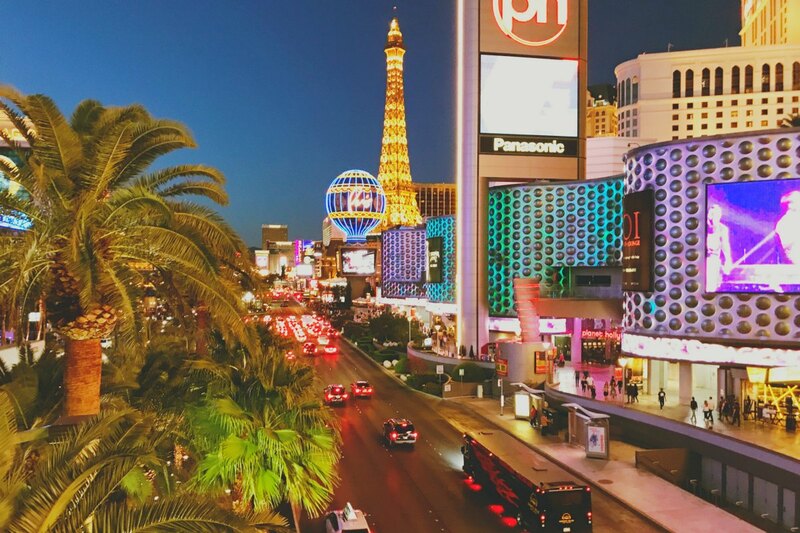 Whether you call it Vegas, Lost Wages or Sin City, you came to enjoy top-quality restaurants, nightlife, gambling, and entertainment and not to spend time searching for a free spot to park your rental car. One of Vegas's best-kept secrets is that it is possible to find free parking at hotels, garages and malls all over the Strip—if you know where to look. Strictly speaking, the Vegas Strip is a 4.2-mile section of South Las Vegas Boulevard known for its concentration of resort hotels and casinos. It stretches from the Stratosphere Las Vegas, on the northern end, to the Mandalay Bay Resort, on the southern end. But the term "Las Vegas Strip" is often used more loosely to describe not only to the road but also to the hotels and casinos lining it, and even to properties in close proximity. All of the resorts on the Strip will let you self-park for free for up to one hour, but that's not tremendously helpful as most visitors spend longer than an hour in any given property. There was a time when all hotels on the Vegas Strip offered unlimited free parking, but the vast majority now charge all guests and non-guests for parking when you stay longer than an hour. Guests will have the parking fee charged to their hotel rooms. Non-guests collect a ticket when arriving at the garage, and pay at the gate when leaving. There are still a few exceptional hotels still offer free parking. The Venetian and the Palazzo offer both free valet parking and self-parking. You'll also have no trouble finding a spot on one of the eight floors in the garage at the Hard Rock and the Hard Rock Hotel Tower. In addition, you can find free self-parking spots all hours of the day at the Tropicana, SLS, Stratosphere, Casino Royale, and Treasure Island. At the vast majority of hotels on the Strip, there is a charge for parking. As you'd expect, the less expensive hotels charge less for parking. For example, MGM Resorts charges $8 to park at the Luxor for three hours but $15 to park at sister resort, the Aria, for those same 3 hours. Circus-Circus offers free self-parking, while valet rates start at $10 per hour. If you're making a quick stop along the Strip, parking at the Cosmopolitan is free for the first hour, and then $7 for up to four hours. At the Wynn and Encore hotels, you park for free as long as you spend at least $50 on dining, gambling, or entertainment—which isn't hard to do. You might not have come to the Vegas Strip to shop, but shopping malls can be the perfect place to snag a free spot. Find a spot at the Shoppes at Mandalay Place (between Mandalay Bay and the Luxor), the Shops at Crystals (in front of Aria and Vdara) and Fashion Show Mall (across the street from Wynn-Encore). Of course, parking at shopping malls is self-park only. There are other ways to snag free parking, but you'll need to be willing to spend first. Are you a high roller? Avid gamblers can earn membership to a hotel's rewards program, and this can also get you access to free parking and other perks all along the Strip. Caesars' players club members can park for free at Bally's, Caesars Palace, The Cromwell, Harrah's, The Linq, Paris and Planet Hollywood, with valet parking included for higher-tier members. The Cosmopolitan has its own players' club rewards program, with free self-parking for all members and free valet for those with more status. Veterans and active members of the US military can sign up for a SALUTE platinum card at any Caesars Entertainment property, and that card gets you free valet parking at any of those properties. Caesars Entertainment includes Bally's, Caesars Palace, The Cromwell, Harrah's, The Linq, Paris, and Planet Hollywood. MGM Resorts have a similar program, called M Life Rewards, that offers free self-parking for vets. The program is good at MGM's many popular locales along the Strip, including Aria, Bellagio, Excalibur, Luxor, Mandalay Bay, MGM Grand, Monte Carlo, The Mirage, and New York-New York.